The Valentine’s Day series looks at modern romance and the contradictions caused by the recent “globalization” of this celebration of love. Young people and university students in Dhaka have begun commemorating Valentine’s Day by wearing red saris, exchanging flowers, and organizing musical events featuring love songs. This American import has attracted the wrath of Islamic militants, who have denounced Valentine’s Day celebrations and even disrupted them with bombs and bloodshed. 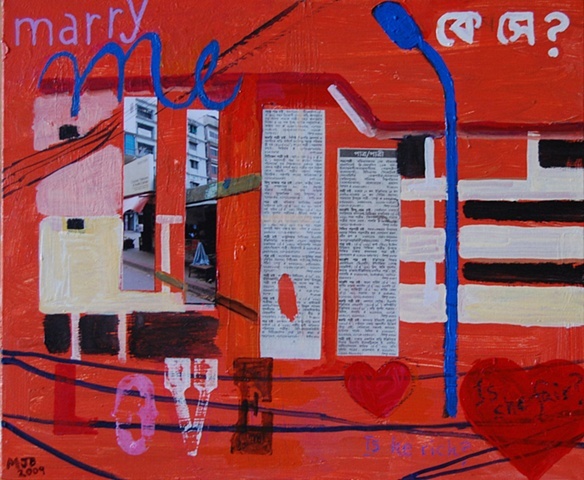 The Eye Candy series has more paintings about love and human connection. 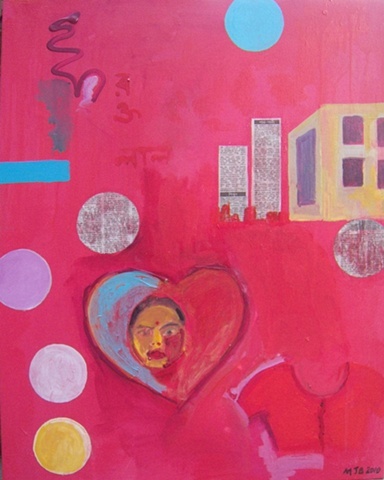 The concept of romantic love is fraught with contradictions in Bangladesh. As a child, I learned a song titled “Bhalobasha Bhalo Noye” (Love is Not Good). 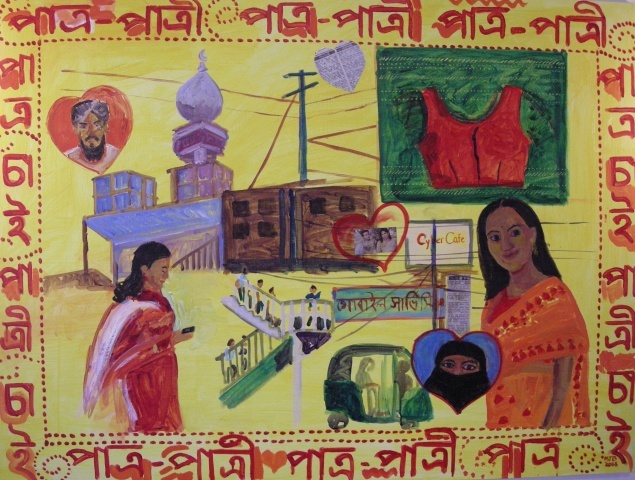 Many families frown upon the notion of someone choosing their own partner, and young girls in Bangladesh are often married off to someone of her parents’ choosing. Yet most Bangla songs are about love, and the popular movies are often bawdy romances. 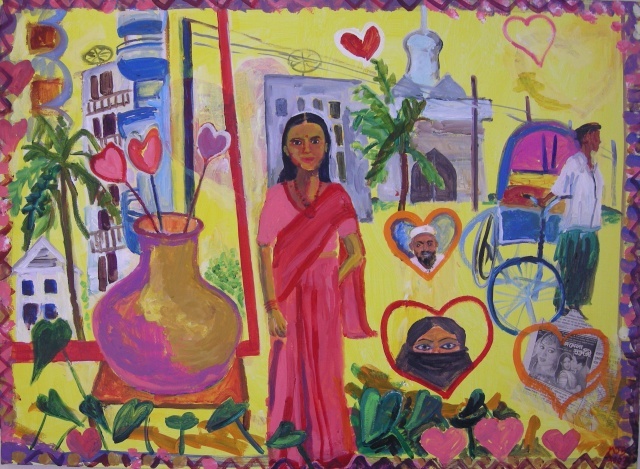 The Valentine’s Day/Love paintings reflect on love and marriage, the effect of globalization on traditional culture, and the conflict between secularism and religious fundamentalism. They also show my continued fascination with the urban landscape in Asia. 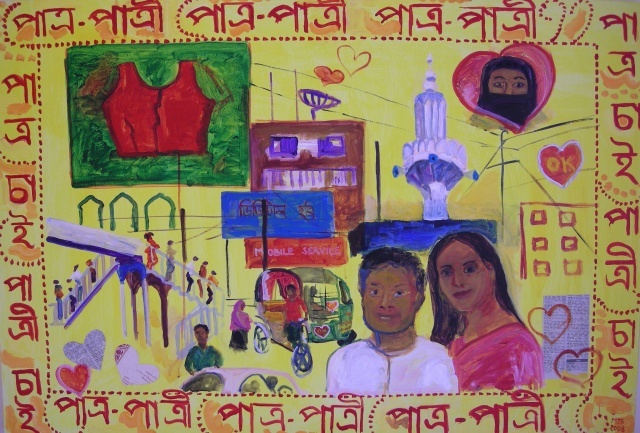 The bright colors, the electrical wires, the cycle rickshaws, the movement of space, and the jumbled up scenes evoke the loud, hot, crowded, and visually stimulating feel of urban life in South Asia. 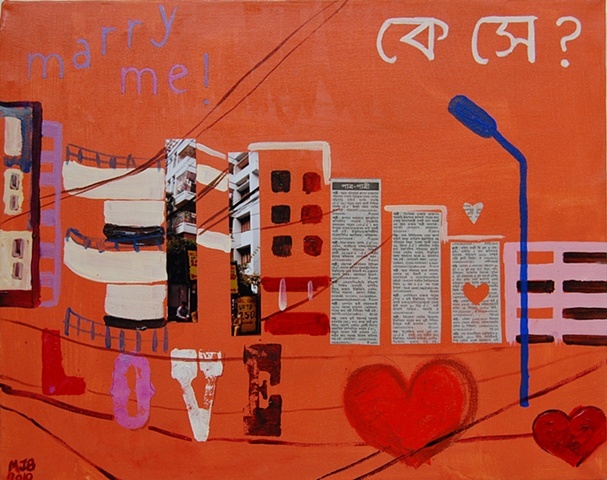 The works often use cutouts from the matrimonial columns in the Bengali newspapers to make hearts, buildings, or circles, speaking to the commodification of love. There is also reference to the use of the internet and mobile phones, new tools to circumvent traditional matchmaking.